Gaia’s Heart and Your Mind–Closing the Gap. What will it take to awaken from this mesmerizing dream of mindless consumption, endless wars, and ecological degradation? From the time you may have passed this magazine on a newsstand, It’s been 32 years and more than 66 TIME covers on the environmental challenges we are facing and still we slumber, or worse, we’re sleep walking ever nearer the precipice. We’re doing far more damage than just poisoning the well. How many thousands of articles, books, movies and TV specials have courageous authors and producers introduced into the marketplace of ideas? How many public presentations offered by thought leaders have you heard ringing the alarm bell that our social, spiritual and ecological injustices must be solved? You probably couldn’t count them all. Is it the media that causes us to avoid seeking root causes to the 1%/99% divide between the “haves” and “have nots”? Are we simply overwhelmed and intimidated by the magnitude of our challenges? I believe we are suffering from psychic numbing. As Mother Theresa said: “If I look at the mass I will never act, If I look at the one, I will.” At a deeper level, people do want serious societal and environmental problems to stop. The question is how do we transcend indifference? ENTER RIGOROUS SELF INQUIRY: Could it be that indifference is a conscious choice? By not caring, we avoid the vulnerability of being informed and guided by our emotions. If we dive into our own hearts and the heart of Gaia, our emotional courage is strengthened and our analytical minds are relegated to play second fiddle. In other words, embrace and honor our emotions, intuition and instincts and we are more likely to act. (“The More Who Die, The Less We Care: Confronting Psychic Numbing,” Science Committee Newsletter,ehealthglobalhealth.com, 2009). According to the Pulitzer Prize-winning New York Times columnist, Paul Slovic, PhD., making decisions and taking action in the face of risk requires two different kinds of thinking. Evaluating risk analytically with reason, quantification and deliberation has the effect of passivity – standing by as a witness. An emotional response to risk is a faster method to access instinctive and intuitive responses to danger in a complex and uncertain world. Of course, both qualities are essential, however our current emphasis upon analysis of problems separates us from a compassionate way of being in the world. Will we survive progress is not a rhetorical question. There is a dynamic experiential program that helps us merge our hearts and minds. It’s called the Awakening the Dreamer Symposium offered by volunteer facilitators. The Pachamama Alliance is the organization that provides the training and resources for this project world wide. You can find out how to engage with this movement by clicking on the links above. The purpose of the Alliance is clear and powerful: “To bring forth an environmentally sustainable, spiritually fulfilling, socially just, human presence on this planet.” Isn’t it about time we implement the dream we’ve always known? If you are in Colorado, there will be a Symposium this coming Saturday – February 25th from 1pm – 5pm at the Wild Bear Ecology Center in Nederland, CO.
I’m delighted to be joining a wonderful team of presenters, so, if nothing else, come say hello, I’d like to meet you! Click on these links to register and learn where we are, how we got here and what we can do now. Wait there’s more (isn’t that the truth!) – once you’ve been inspired to change our world for the better, before you do, consider joining me and my co-guide Jennifer Menke in the Canyonlands for a Sacred Passage this March 30 – April 9th. You’ll appreciate gaining a direct connection with Nature and the Earth in the wild. We will help you Quiet your mind, Open your heart and Revitalize your Life. This nature centered experiential program will provide you with the Earth Empowerment you’ve been yearning for. The most common report we hear from our Sacred Passagers is renewed energy, tremendous creativity and greater clarity to navigate through these turbulent times. People emerge absolutely radiant and ready to re-purpose their lives. My faithful readers know that I like to balance the earnestness of my articles with music, sometimes serious, sometimes light hearted. Here is a flash back to 1970. The wisdom and foreshadowing of the Kinks is revealed. Enjoy Apeman…let’s trust we are making gradual “progress” in the domain of conscious evolution. Bud Wilson is the Founder of Deep Nature Journeys. He is a wilderness guide, awareness trainer, and Qi Gong instructor. His advanced training included a 108 day pilgrimage to Nepal, Thailand, and Indonesia visiting sacred sites, receiving teachings and transmissions, followed by a 40-day solo in the Cochise Stronghold of the Desert Southwest. He is also a social and environmental entrepreneur engaged in societal change as a senior associate researcher and writer for Environmental Communications. 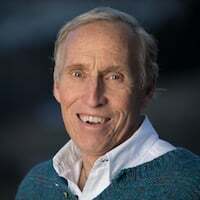 He co-designed international symposia for John Denver’s Windstar Foundation called “Choices for the Future” and coordinated the first World Nature Quest for 35 groups in 17 countries on 5 continents. His interdisciplinary degree from Harvard University included Urban Social Policy, Child Development, and Innovative Education. This partly explains why R. Buckminster Fuller once referred to him as an “adaptive generalist / comprehensivist.” He has conducted programs for the University of Colorado, Naropa University, The Life Force Project, University of Michigan, Rotary International’s Preserve Planet Earth Campaign, Sacred Passage & The Way of Nature, and The Pachamama Alliance “Awakening the Dreamer” events. Connect with him on LinkedIn and Facebook.